Wet & Wild Package! No offers at this moment! Any time is the perfect time for a getaway to Crown Reef Beach Resort and Waterpark! Easter is fast approaching, and we hope you decide to spend it with us! Enjoy your time with us on April 21st this Easter Sunday with our Breakfast Buffet! We have prepared an eggcellent Easter breakfast for you and your family. The buffet will take place from 7:00 a.m. to 11:00 a.m. If you are looking forward to a special guest, we have great news! You can expect an appearance from the Easter Bunny from 9:00 a.m to 11:00 a.m. during breakfast. Make your way to our Grab and Go Café located in Tower 1 on the lobby level for this fantastic meal. * Pre-purchase for breakfast when booking your stay to save $1 off your meal! Continuing the Easter festivities, head to the North parking lot by the grass on the Conference Center side to participate in our Easter Egg Hunt! We will have two separate Easter egg hunts, one for 5 and under, and another for 6+ years. It is open to the public and fun for all ages! 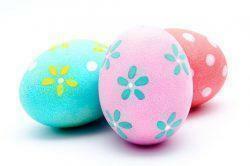 Our fun filled Easter Egg Hunt will start at 12:00 p.m. and run until 1:00 p.m. Enjoy this day full of prizes and games for no charge at all! For more information call 843-626-8077. You and your family can look forward to a weekend of fun! Between our indoor pool and whirlpools, heated outdoor lazy river and our waterpark boasting two four story slides and kid-sized tree house and slide, you won’t be hearing the words “I’m bored” from your family any time soon. It doesn’t stop there. Spend your evenings playing timeless arcade favorites like skee-ball and air hockey in the state-of-the-art, coin-free arcade, Game On! Rack up tickets on your arcade card for fun prizes in the redemption center, Winner’s Circle. Myrtle Beach is teeming with fun activities for the whole family leading up to and Easter weekend. Check out some of the festivities we think your family will love below. Book your Easter getaway with us at Crown Reef Resort now! "The pool and water park was AWESOME! We couldn't get enough....Kudo's to Crown Reef for offering such a family friendly environment!" Angelia C.
"Water park for kids was amazing!" Shakema T.
"We enjoyed our stay, very friendly, great room service, lots of fun at the pools and waterslides, great family environment!" TJ P.
"Crown Reef Resort was the best family vacation experience!" Pablo B. "By far best resort ever!" Nelly C.
"We have stayed at the Crown Reef Resort for the last 3 years. Love this place!" Kay R.
"This hotel made sure we were very well taken care of! Thank you Crown Reef for the super friendly staff, the clean hotel, and the memories we made with our soldier! Our kids had a blast!!" ‎Brandy B. "This place is awesome for kids and adults!" Elizabeth T.
"Vacation was a blast!" ‎Lynda R.
© Crown Reef Resort 2019 All rights reserved.